Mass Mixers that are suitable for homogeneous mixing of wet and dry particles in pharmaceuticals, chemical dyestuff and other industries. We are engrossed in presenting an extensive range of Powder Mass Mixer to the prominent customers. Offered range is extensively commended amongst patrons for their compact designs and sturdiness. These products are developed with use of quality-approved components in line with the universal market standards. Our organization is providing a broad assortment of Powder Mass Mixer to our clients. These products are assembled using optimum quality components. 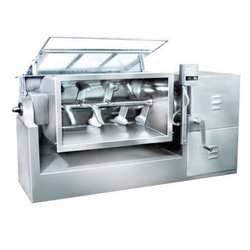 Powder Mass Mixer provided by us is known for its uninterrupted and hassle-free service. - Mixing of wet materials. - All materials even in smallest proportion are distributed evenly in total mass. - Mechanical/motorized tilting of vessels with limit switches etc. - Also available ribbon blenders. - Capacity from 25 kg. to 1 ton.